The Uttarakhand Board of School Education (UBSE) has declared the High School (Class 10) Examination 2017 and the Intermediate (Class 12) Examination 2017 results today, 30th May, 2017. 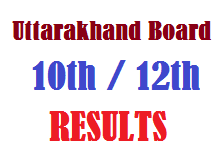 Candidates who appeared for Uttarakhand 10th and 12th Examination this year can check their results by clicking on the following links. The exams for 12th class were conducted by Uttarakhand Board during February and March 2017. Roll Numbers are required to check Uttaranchal 10th Class Results 2017. The contact email id is secy-ubse-uk@nic.in.